Dana Eudy mixing calendula, comfrey, oats, and plantain that will be infused in oil to make a healing salve. Health care has been much in the news these last few years, and preventative care understandably looms larger in the landscape. Helping people stay well is in everybody's best interest. 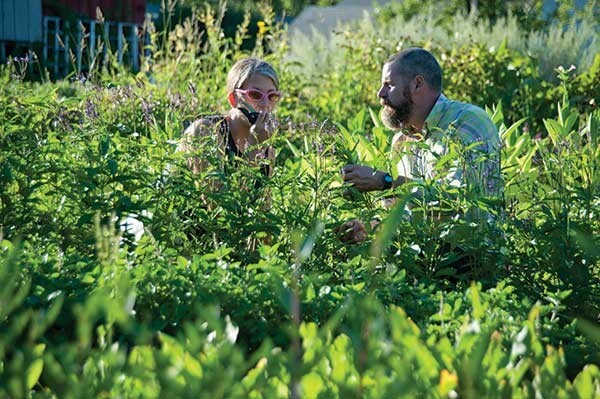 On three acres behind their spacious Victorian house in Germantown, Dana and Michael Eudy are hard at work building a medicinal herb farm into a prosperous business. Field Apothecary, in its second year, offers a resource for those interested in using locally grown plants to maintain wellness. 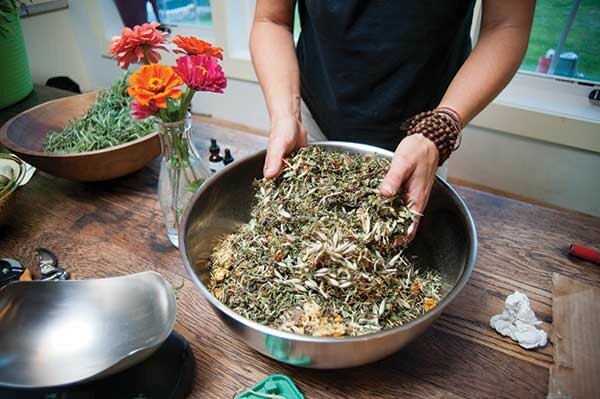 Both from Texas, by way of Brooklyn, the couple came to their love of herbs over the course of several years. For Dana, it was childbirth that sparked the interest. For Michael, a year spent in Italy earning an MFA in painting was his turning point: "We had never tasted food like they have there. All the food at the markets was from local farmers." Eyes thus opened, Dana began taking classes in homeopathy and naturopathy while Michael stayed home with their two children, working part time. Then he took an eight-month intensive course that she initially planned to do, since he worried about her workload. "I started off just being the supportive husband, and then I fell down the rabbit hole too." Dana is the more mystically inclined, speaking frequently about the plants' energies, while Michael approaches them with a cook's (or bartender's) experimental curiosity. It appears to be a potent pairing; they frequently finish each other's sentences and their enthusiasm is evident and contagious. "We have lost our understanding of plant-based preventative medicine," Michael says, describing a health-care pyramid analogous to the food pyramid we all know. "Emergency and hospital care is at the top, with specialists below, then your family doctor, then holistic care below that and grassroots care at the bottom." Like the food pyramid, the things at the top should be consumed in small amounts. "If we can treat our fevers, coughs, and some of our mental health at home, we take a huge amount of demand off of the overburdened health-care system." Since the Eudys are not certified to prescribe anything, Michael says, "when people come to us with specific problems, the best we can do is say, 'These are herbs that have traditionally been used.'" Dana and Michael Eudy harvesting Blue Vervain. Walking through the neatly ordered garden, with well-weeded beds separated by mulch or mown grass, Dana expounds on the value of medicinal plants. "We evolved from the plants. They are our ancestors. They evolved these immune systems that absorb every toxin and pathogen in the environment and develop compounds to fight them." Holding up a mint leaf, Michael continues. "We have spent millions of years evolving so we can extract nutrients from plants. There are probably 2,000 compounds in this leaf. Modern medicine tries to isolate between one and five of them and standardize the dosage. Nobody knows how all of them function together." An herbal CSA forms the center of their business. Last year 30 members received one large delivery in late September: tinctures, syrups, dried herbs, salves, salts, and "fire vinegar," macerated with garlic, onion, horseradish, and cayenne. They hope to expand the CSA to 60 members and four seasonal deliveries by next year. They also have a truck, which they are renovating into a food truck of sorts and which they hope to use as a combination mobile pharmacy and base of operations for the "pharm-to-table dinners" they are planning with a local chef. They also offer classes in ayurvedic medicine and growing and using medicinal plants at home. "Spilanthes is a great teaching aid," Dana says, proffering a tight yellow bud for tasting. Initially citric acid-sour, the sensation quickly expands to a tear-inducing, almost wincing intensity, accompanied by copious salivation and a numbing heat not unlike Sichuan peppercorns. "We use it in our mouthwash." 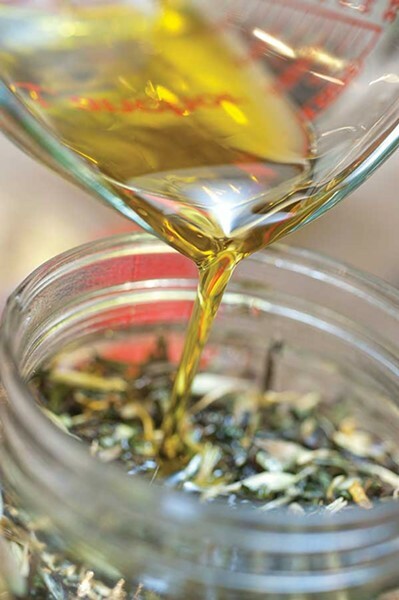 Pouring olive oil into an herb mixture. Back in the house, preparing a lunch of rice with tarragon pesto and sorrel soup (with lemon balm added to enhance the lemony tang and some kale to keep the color green since sorrel browns quickly) blended with chicken stock, Michael apologizes unnecessarily for his improvisational method in the kitchen: "I've never actually made this exact thing before." The result is bright yet hearty, with the lemony tang of sorrel burnishing the sturdy stock, and the pesto on rice, simple food to be sure, nonetheless commands attention, especially for a diner who was in the field when the herbs were cut. Knowing their provenance, having seen and smelled and nibbled them outside, one becomes more receptive to and appreciative of their complexity and benefits.